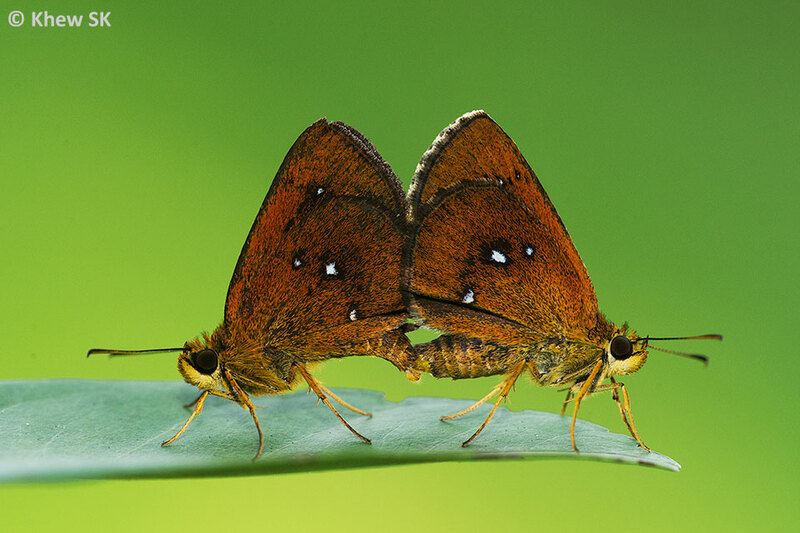 After the first few articles in this Butterfly Photography 101 series on selecting equipment, settings on your DSLR, focusing, exposure and using fill-flash for your butterfly photography, you are now ready to get outdoors in the field and start shooting butterflies! 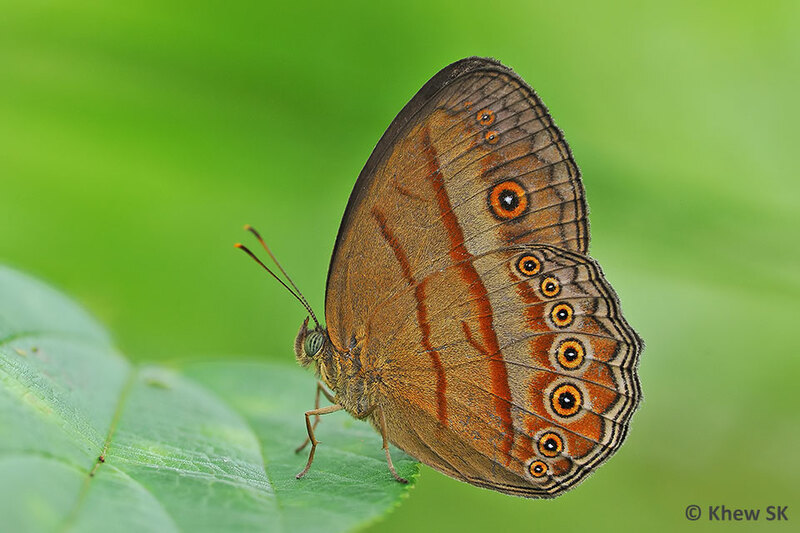 For some hands-on stalking and tracking advice, refer to an earlier article on this blog on Stalking and Shooting Butterflies. 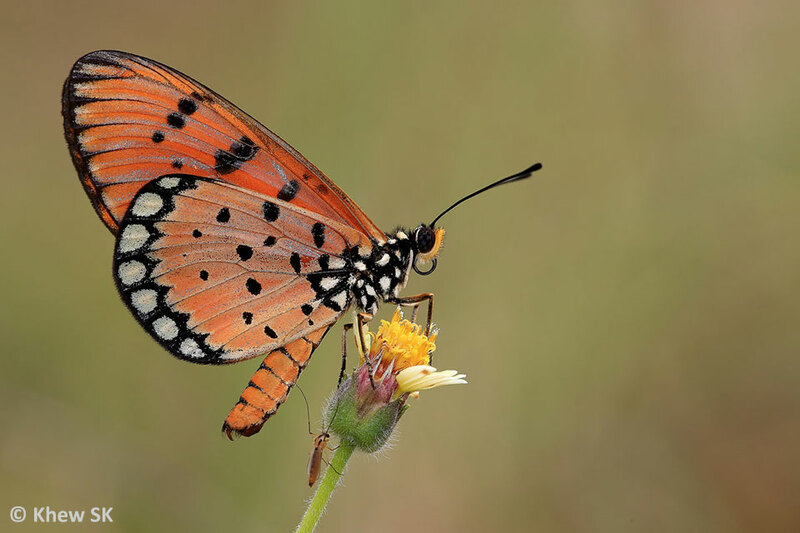 No matter how well you know the technical aspects of your photographic equipment, or your ability to acquire the latest in camera bodies and lenses, a badly-composed butterfly photo will put all that to waste. 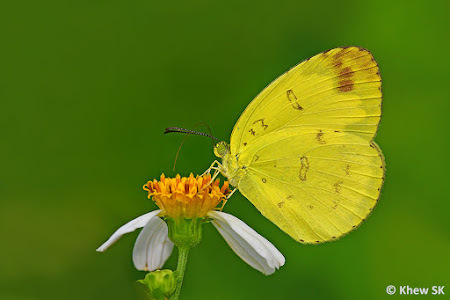 This article shares some important composition tips or guidelines for butterfly photography. Bear in mind that in photography, the most important rule is that there are no rules. However, there are basic guidelines that can make the difference between an average picture or a great one! Firstly, try to recall a butterfly photo that recently captured your attention. What was it about the photo that you found attractive and pleasing to the eye? 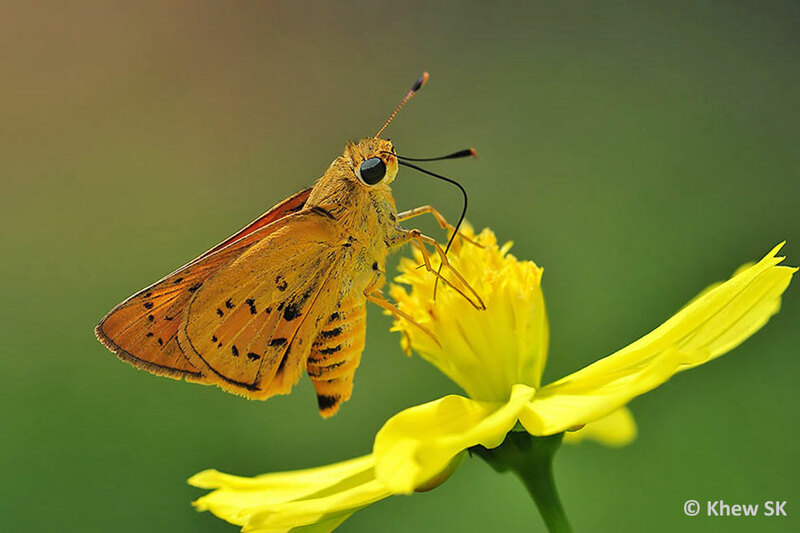 Was it the colour, the way the butterfly perched on a flower, the aesthetic balance of various elements in the photo, or something else? Like a painting or a piece of art, a photo that appears pleasing to the eye, often contains certain basic guidelines in composition. At times, it may just be a "feel good" factor about the photo, but more often than not, the photo is composed along the lines of one or more aesthetic conventions used in the visual arts. Let us try to understand what is "composition" all about. In essence, composition refers to the way various elements in a scene are arranged within the frame. In visual arts, there are certain guidelines that determine how different elements interact within the field of view, which elements are the focus of attention, and so on. These guidelines have been used by artists and painters from time immemorial to create their work. In the field of photographic composition, these guidelines are equally applicable. Focus on the eye of the subject and make sure it is as sharp as possible! 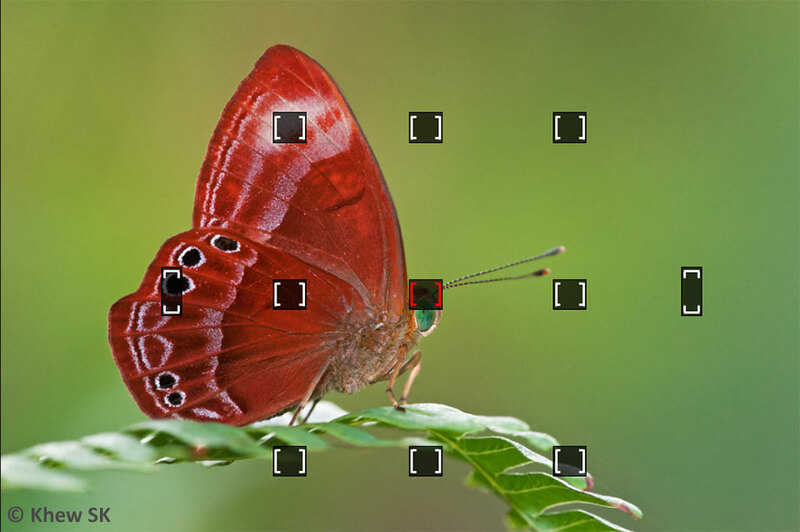 For a start, this is not a composition guideline per se, but absolutely critical to any nature photo. 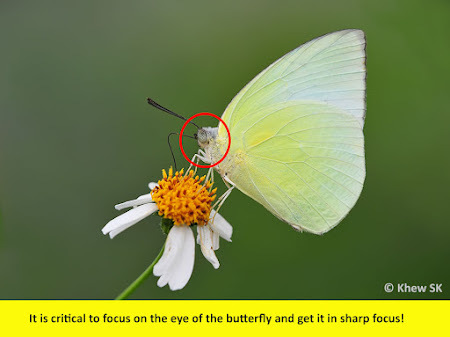 When shooting a butterfly, it is essential to focus on the eye and ensure that the eye (or eyes) are in sharp focus. When you take a first look at a butterfly photo, you may not realise that your own eyes often tend to lock on to the eyes of the subject. This is a natural phenomenon when looking at a photo of a bird, a lizard, a spider, a butterfly or even another person! If the eyes are out of focus or blur, the feeling that one immediately gets is that there is something uncomfortable or wrong about the photo. I have lost count of the number of butterfly shots that I have dumped in the trash bin where the eyes of the subject are out of focus. 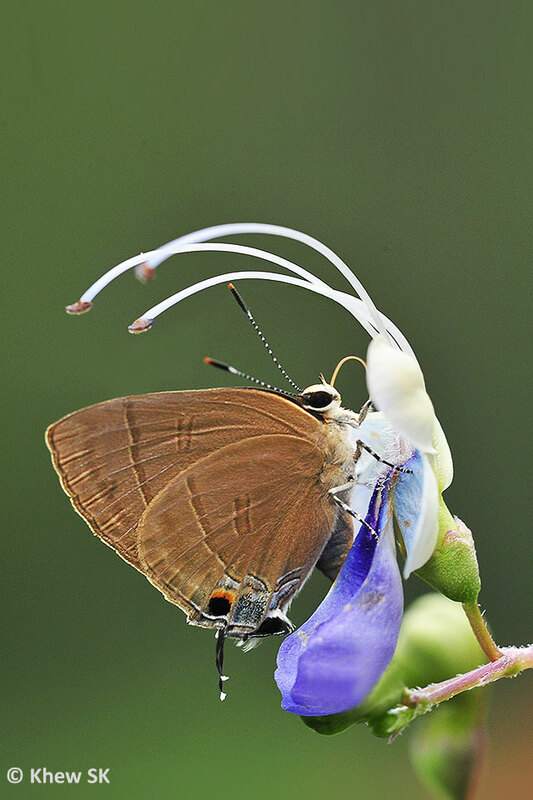 So, from the start, set yourself a high standard in your quest for good butterfly photography and get the eyes sharp! 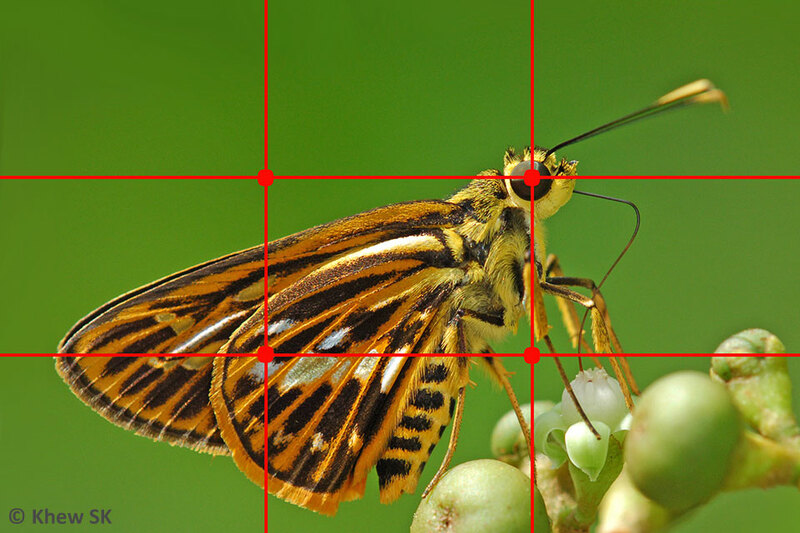 This composition guideline is very fundamental to nature macro photography but sometimes overlooked. In fact, it is quite relevant to many genres of photography and even applicable for inanimate subjects like a photo of a car zooming along a road. 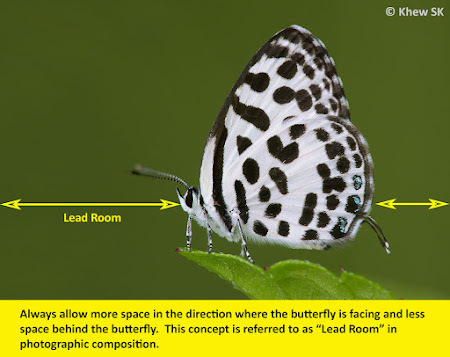 The concept of "lead room" is premised on the idea that a well-composed shot should leave space in the direction where the subject is facing or moving. 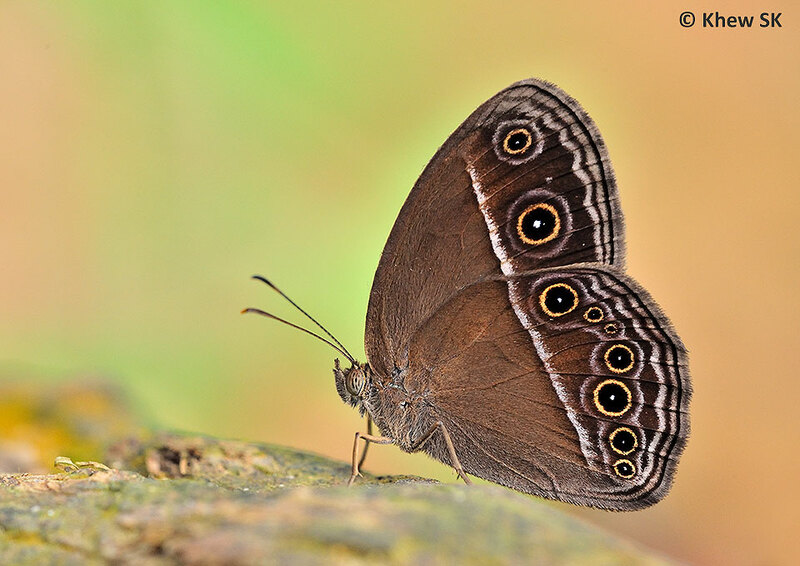 Hence compose your butterfly shots with the lead room or "positive space" in front of the butterfly's eyes. 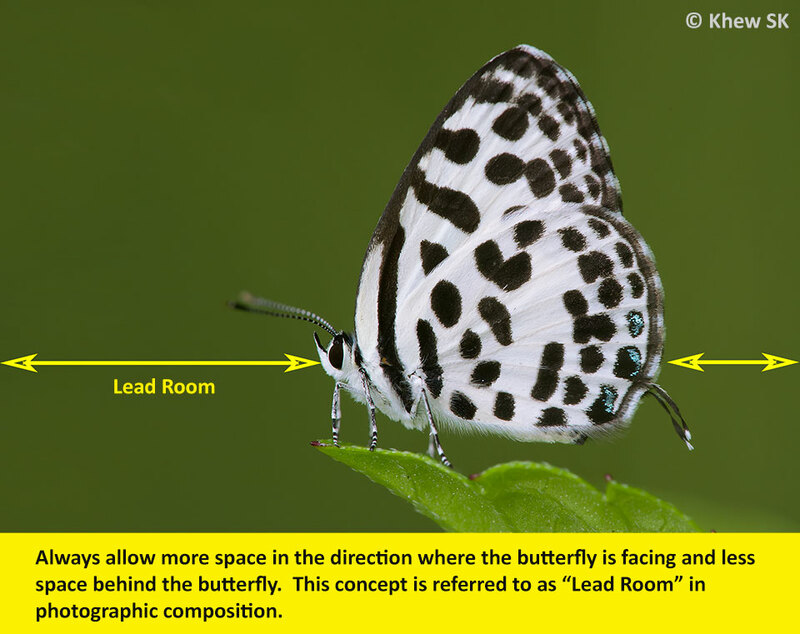 Note that the lead room need not only be on the left or right of the frame, but corresponding to where the subject is looking towards. Placing the subject smack in the centre of the frame with symmetrical empty space on the left and right of it makes for a boring and ordinary snapshot. 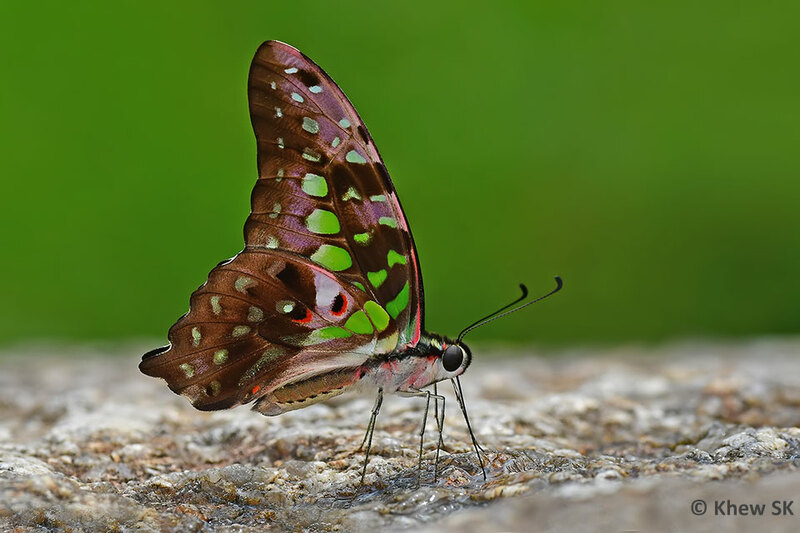 When I first started butterfly photography some 20 years ago, I was happy enough just getting a shot of a particular species of butterfly. Back then, managing to get a butterfly in focus in my viewfinder was good enough for me. Never mind that the background was cluttered with twigs, bright hotspots, and artificial mess; just getting a shot of a particular species that I was looking for, made my day! Over the years, I have come to allocate as much importance to the background as I would to the subject. Where possible, having a clean and uncluttered background enhances the subject butterfly and makes the appreciation of the subject easier without too many distractions. Although it is not always possible to dictate where a butterfly stops to feed or rest, in relation to the background, whenever a subject snaps into focus on my viewfinder, my eye quickly scans the background as well, to see if I can shift the angle to get a better background for the subject. In macro work, where the photographer is closer to the subject, the opportunity to throw the background out of focus is much easier (especially when you are using a proper macro lens). Hence if there are minor distractions in the background, using a large aperture to 'soften' the background sometimes helps. But do make sure that the subject is still in sharp focus! 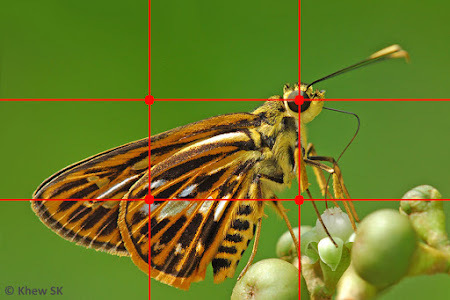 The Rule of Thirds (coincidentally called a "rule") is an important composition guideline in the visual arts that states than an image is most pleasing and well balanced, when its subject is composed along imaginary vertical and horizontal lines that divide the image into thirds. This guideline is applicable to butterfly photography as well. 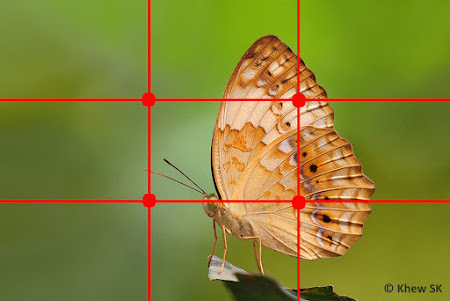 Placing the butterfly's eye on the imaginary grid line along the "Rule of Thirds"
Hence, to maximize the impact of your butterfly photos, your subject or your area of interest should always be placed at or near one of the intersecting points or along the imaginary grid lines. 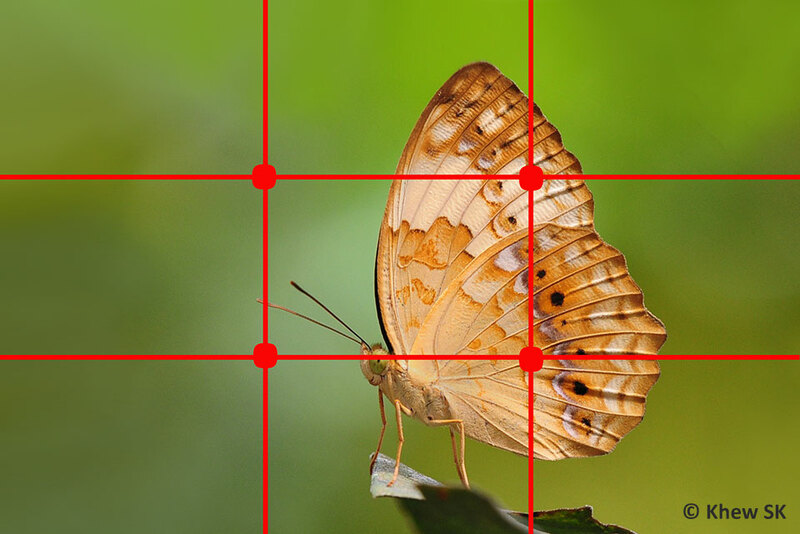 These points create visual tension, dynamism and interest in the composition and research has shown that the human eyes are naturally drawn to these intersecting points and the imaginary grid lines. 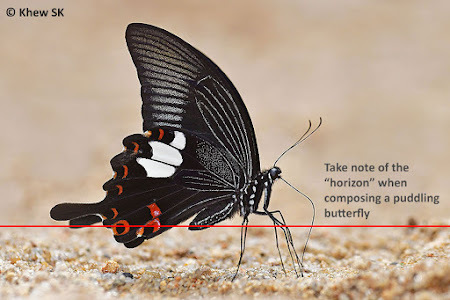 Another tip when shooting puddling butterflies and applying the composition on the Rule of Thirds, is to make sure that the "horizon" or ground plane behind the butterfly is properly aligned to the horizontal. A slightly tilted horizon behind a puddling butterfly is uncomfortable and may spoil an otherwise good shot. Composing a shot along the X-Y axis within a frame and respecting the guidelines mentioned above often makes for a good shot. However, there are often variations to the theme when different framing and field conditions allow. For example, using diagonals and taking the subject off the X-Y axis sometimes results in a more dynamic and interesting shot. Diagonals tend to suggest action and liveliness in a shot, creating a notion of dynamism and visual tension. In some situations, when a shot features a linear element e.g. a twig, a blade of grass or patterns, try to experiment by shifting or rotating your camera so that these linear elements run diagonally across your frame. These options can sometimes create a shot that is more well balanced and interesting to the viewer and not end up as a dull and uninspiring shot. In the next instalment of this article on composition, we discuss other aspects of composing butterfly shots which are less conventional and challenge the "rules" of visual composition.